​Don’t miss the videos below and more science facts! ​BONUS: Why is the Earth Blue? 2) YOU DON’T ALWAYS SEE THE SAME CONSTELLATIONS. If the earth was flat, everyone should be able to see the same constellations all the time, as if we all were staring up from the same section of summer grass. If we call a friend in Australia and ask them what constellations they can see at night, they won’t be the same as what we see. Because the Earth is a shape other than a flat disk, when looking into the night sky the Earth itself can block our view. The Big Dipper, a set of seven stars that looks like a ladle, is always visible at latitudes of 41 degrees North or higher. Below 25 degrees South, you can't see it at all. And in northern Australia, just north of that latitude, the Big Dipper just barely squeaks above the horizon. Meanwhile, in the Southern Hemisphere, there's the Southern Cross, a bright four-star arrangement. That constellation isn't visible until you travel as far south as the Florida Keys in the Northern Hemisphere. 3) THE SAME OBJECTS MAKE DIFFERENT SHADOWS. If the Earth were flat, you could drive two sticks into the ground at any place on Earth, and the shadows those sticks would make would be the same length. 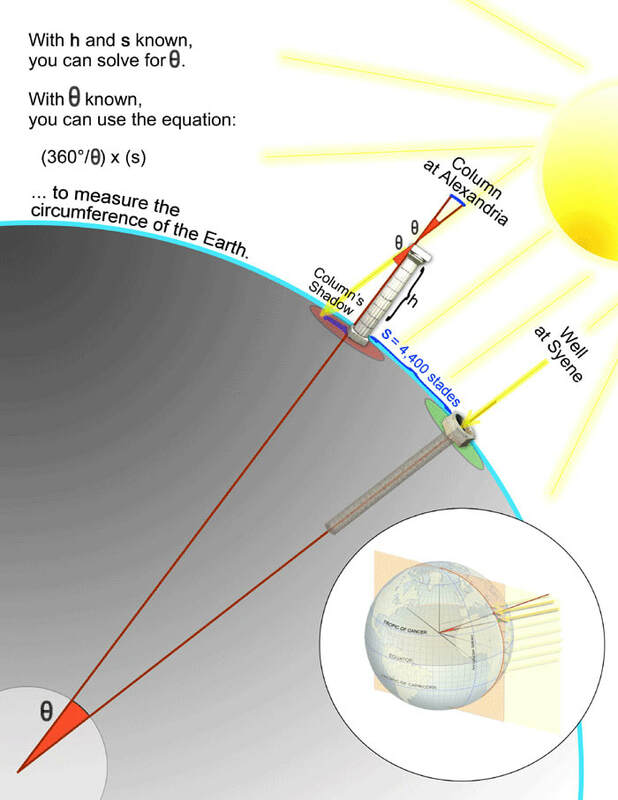 (Because the Sun is so far away from Earth, its incoming rays can be considered parallel). You can do this experiment at home. Place a stick in the ground on a sunny day, then measure the length of the shadow. At the same time, call a friend who is at least a few miles away from you and tell them to do the same. The lengths you measure will be different. The curvature of a spherical Earth means that sun rays will hit each stick differently if they are far enough apart. On a flat Earth, there wouldn't have been any difference between the length of the shadows at all. The sun's position would be the same, relative to the ground. Only a globe-shaped planet explains why the sun's position should be different in two places from a few miles or a few hundred miles apart. 4) TIMEZONES EXIST. To make the seasons work with a flat Earth, advocates claim that the Sun orbits in a circle above our disk, like a tetherball on an invisible string. But timezones exist. Try calling someone in China right now and convincing them that you are experiencing the same time of day (and then apologize). A flat Earth can’t account for how some parts of the planet are in darkness while other parts are bathed in light. 6) ECLIPSES SHOW EARTH’S SHAPE. Have you ever seen a lunar eclipse? It’s when the Earth passes in between the Sun and our moon and casts a shadow over the lunar surface. If you look closely, you can pick out a slight curvature. 7) NUMEROUS PHOTOS. We’ve seen earth from space from multiple angles and it’s always a sphere. ​This is another one of those self-evident things: You can see farther if you go higher. If the Earth was flat, you'd be able to see the same distance no matter your elevation. Think about it: Your eye can detect a bright object, like the Andromeda galaxy, from 2.6 million light-years away. Seeing the lights of, say, Miami from New York City (a distance of a mere 1,094 miles or 1,760 kilometers) on a clear evening should be child's play. ​But it's not. That's because the curvature of the Earth limits our sight to about 3.1 miles (5 kilometers)… unless you climb up a tall tree, building or mountain and get yourself a perspective from higher up. Read about the new heavens and the new earth! A time exposure of the northern sky, revealing the motion of all the stars around Polaris due to Earth's spin. Image via Shutterstock. Stade, an ancient Greek unit of length. ​4400 stades is about 506 miles (814 kg). MOON (LUNAR) PHASES:​ Lunar phases are created by changing angles (relative positions) of the earth, the moon and the sun, as the moon orbits the earth. 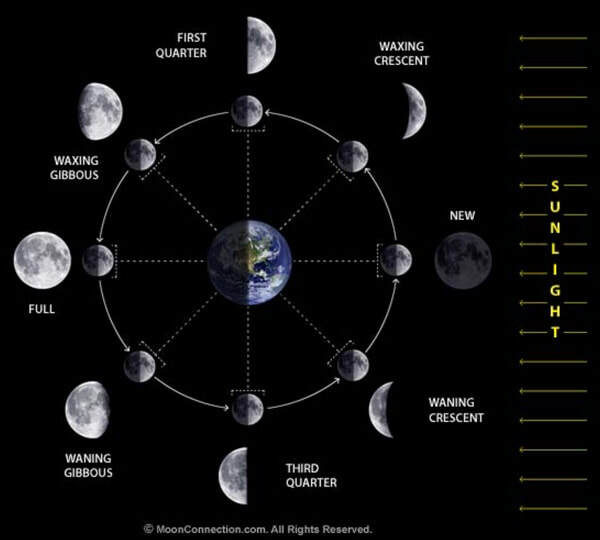 Diagram above demonstrates how phases work; the small inner moons in the diagram do not show the fact that the same side of the moon always faces Earth. This is because the moon rotates on its axis at the same rate that the moon orbits the earth (also called synchronous rotation or tidal locking). Where tidal forces from earth have slowed down the moon’s rotation to the point where the same side is always facing the earth. As the Sun sets, the Moon rises with the side that faces Earth fully exposed to sunlight. 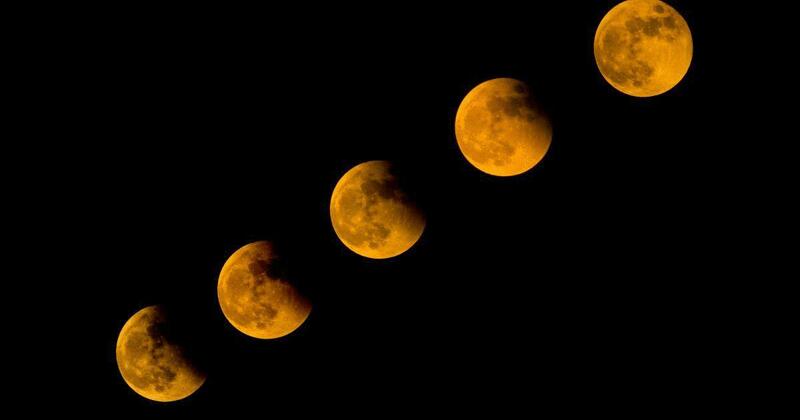 The Moon has phases because it orbits Earth, which causes the portion we see illuminated to change. The Moon takes 27.3 days to orbit Earth, but the lunar phase cycle (from new Moon to new Moon) is 29.5 days. We only see the moon because sunlight reflects back to us from its surface. During the course of a month, the moon circles once around the earth. WHAT ASTRONAUTS EXPERIENCED ON THE MOON: It seems that before they emerged from the “Eagle,” the Lunar Lander, Armstrong’s co-pilot Buzz Aldrin, pulled out a Bible, a small silver chalice, and some sacramental bread and wine. There on the moon, their first act was to pray and celebrate communion. ​Charles Duke, who followed Irwin to the moon, later became active in missionary work. As he explained, “I make speeches about walking on the moon and walking with the Son of God.” Guy Gardner is a veteran astronaut who speaks in churches on the reality of God. And yet more science facts . . .
​CORIOLIS EFFECT: In the Northern Hemisphere, hurricanes spin counter-clockwise. In the Southern Hemisphere, hurricanes spin clockwise. This is caused by the Coriolis Effect: it’s all because we live on a giant spinning ball (Earth Lab). EARTH SPINNING: Earth spins on its axis once in every 24-hour day. We don’t feel Earth spinning because you and everything else – including Earth’s oceans and atmosphere – are spinning along with the Earth at the same constant speed. It’s only if Earth stopped spinning, suddenly, that we’d feel it. Then it would be a feeling similar to riding along in a fast car, and having someone slam on the brakes! Think about riding in a car or flying in a plane. As long as the ride is going smoothly, you can almost convince yourself you’re not moving. A jumbo jet flies at about 500 miles per hour (about 800 kph), or about half as fast as the Earth spins at its equator. But, while you’re riding on that jet, if you close your eyes, you don’t feel like you’re moving at all. And when the flight attendant comes by and pours coffee into your cup, the coffee doesn’t fly to the back of the plane. That’s because the coffee, the cup and you are all moving at the same rate as the plane. Now think about what would happen if the car or plane wasn’t moving at a constant rate, but instead speeding up and slowing down. Then, when the flight attendant poured your coffee … look out! ​MOUNT EVEREST: If the earth was flat, you should be able to use a telescope to see Mount Everest in Nepal, the highest mountain in the world at 29,035 feet (8,850 meters) above sea level. But it’s not possible as the earth is round. Denali (also known as Mount McKinley), in Alaska, is the highest mountain in North America at 20,310 feet (6,190 m). The highest mountain in the continental USA is Mount Whitney at 14,494 feet (4418 meters). LONG DISTANCE TRAVEL: Planes traveling long distances fly what is commonly referred to as “great circle routes“, which absolutely account for the curvature of the Earth, allowing them to fly shorter routes than a traditional straight line. BOAT NAVIGATION & GPS: Boats use GPS to navigate, which is based on satellites, which wouldn’t exist if the Earth was flat and gravity was a lie (see Gravity video above). In high latitude navigation (in the arctic), sometimes the GPS satellites are blocked by the curvature of the Earth and other methods need to be employed. 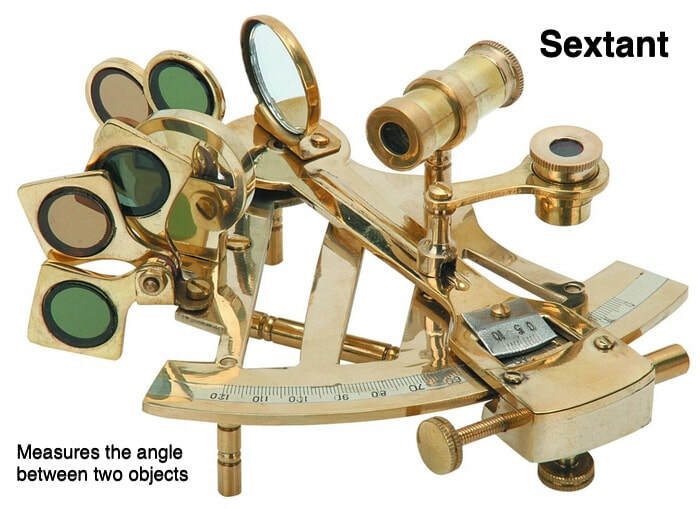 Another means of maritime navigation in use since the 1700’s is the sextant (see image above). Many ships still carry one today as a backup to GPS-based navigation. Navigators take the refraction of light by the lower atmosphere into account when using a sextant – something you would not need to do on a flat Earth.